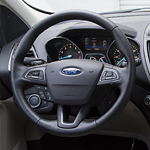 The Ford Escape is all about convenience. Entry into the vehicle is simple as can be. The Access Key allows you simple entry into the vehicle where you can start it by pushing a simple start/stop button. Another convenient feature is the hands-free, foot-activated liftgate, which lets you open the rear door with a simple kick under the bumper. When you’re ready to make the transition from car to SUV, consider checking out the Ford Escape. Stop at the store in Hampton and take the Escape out for a test drive.